Jiang, Y., Liu, X., Yang, S., Song, X., and Wang, S. (2019). "Combining organosolv pretreatment with mechanical grinding of sugarcane bagasse for the preparation of nanofibrillated cellulose in a novel green approach," BioRes. 14(1), 313-335. The production of nanofibrillated cellulose (NFC) from bagasse was optimized through a novel green approach by combining an organosolv pretreatment with microgrinding. Bagasse was processed through organosolv pretreatment with trifluoroacetic acid (OPT) as a catalyst to provide precursor fibers with full control of chemical components for NFC production. The mass balance of the pretreated bagasse through OPT (OPTB) was determined by its chemical components and total organic carbon analysis. OPT was found to be an efficient and energy-saving strategy for recovering cellulose, as well as hydrolyzing hemicellulose and lignin. Noncellulosic contents in OPTB fibers were optimized to obtain a high NFC yield through microgrinding. The highest NFC yield relative to the mass of precursor fibers of 72% was achieved through mechanical defibrillation of the OPTB containing noncellulosic content of 29%, which generated nanofibrils with the average diameter of 9 nm. In biorefinery principles, OPT not only converted 57% of bagasse to solid cellulosic fibers for NFC preparation, but also 30% of bagasse to valuable bioproducts including the hemicellulose-derived xylose (19%) and lignin-derived organosolv lignin (11%). The combined OPT and microgrinding produced NFC and simultaneously extracted bioproducts from bagasse while using easily recoverable and low environmental impact reagents. Nanofibrillated celluloses (NFC) are the nanostructured fibrils derived from cellulosic fibers. They have lengths in the micron scale and widths ranging from 5 to 100 nm. Due to its unique structural and physical aspects, NFC as a natural nanomaterial has gained widespread attention in various applications, especially in the fields of composite reinforcement, films, coatings, cosmetics, and packaging materials coatings (Eichhorn et al. 2010; Habibi et al. 2010; Azeredo et al. 2012; Abdul Khalil et al. 2014;). Moreover, with growing interest in environmental and sustainable products, the promising biodegradability and renewability of NFC has inspired many studies utilizing it as a green alternative to petroleum-based materials. Bagasse, an agricultural crop residue, is an important lignocellulosic source due to its abundant availability and fast renewability worldwide. Several countries use bagasse in the paper and composite panel industries, as well as directly combusting bagasse to produce heat energy (Xu et al. 2006). Recent studies involving the utilization of bagasse focus on high value-added materials, and the production of paper/nanopaper and biofuel from bagasse are attracting significant interest (Mesa et al. 2010a,b; Ghaderi et al. 2014; Zhang et al. 2016). Bagasse has great potential to be processed or fibrillated to produce biofuels and nanofibrils, which can be ascribed to its pliant bonded structures. The NFC has been extensively isolated from cellulosic fibers through mechanical disintegration. Compared with chemical treatments for NFC preparation, the mechanical methods have advantages of saving chemicals, being environmentally friendly, generating high yield, and being sustainably produced. However, the large energy consumption is the main disadvantage of NFC preparation via mechanical methods. The typical methods of mechanical fibrillation include high-pressure homogenization (Stenstad et al. 2008), microgrinding (Nechyporchuk et al. 2016), cryocrushing (Alemdar and Sain 2008), and microfluidization (Ferrer et al. 2012a). Generally, the NFC produced through each method has different morphological characteristics. Chemically and mechanically fibrillation-facilitating treatments of lignocellulosic fibers to obtain the precursor fibers for NFC preparation are commonly required before the operations of most nanofibrillation equipment. This is necessary to avoid the clogging of long, entangled fibers in the equipment, improve the accessibility of cellulose fibrils, and reduce the number of processing steps for energy savings. Among the developed methods for mechanical defibrillation, microgrinding is the most promising NFC producer on the industrial scale (Hoeger et al. 2013). The ultrafine grinder has few restrictions with respect to the precursor fibers, because it can grind the fibers with different sizes by adjusting the gaps between the two stone disks. More importantly, the precursor fibers obtained through different mechanical or chemical treatments for lignocellulosic fibers usually have many differences in chemical composition and fiber properties. Therefore, the grinder provides opportunities for producing the NFC with different properties and functions (particularly the morphology, surface chemistry, crystallinity, degree of polymerization (DP), etc.) from various types of precursor fibers. This will greatly broaden the applications of NFC in many fields. Additionally, compared with the microfluidization and homogenization, the microgrinding needs lower energy input to produce NFC with similar properties (Spence et al. 2011). The energy consumption of the microgrinding generally linearly increased as the defibrillation process proceeded, and the energy consumption per pass through the microgrinding is about 2.2 kWh/kg when the grinder is set at 1500 rpm with the gap between the grinding stones of -100 μm (Jiang et al. 2018; Liu et al. 2018). Pulping and bleaching processes, similar to those used in the papermaking industry, are common treatments of lignocellulosic fibers for preparing the precursor fibers to produce NFC. Kraft pulping and chlorine bleaching are the leading methods for preparing precursor fibers (Nechyporchuk et al. 2016). However, the developments of these pulping and bleaching approaches are hindered by the increased environmental requirements to the quality of wastewater and gas emissions of the industrial enterprises. In comparison, organosolv pretreatment and pulping is a promising efficient approach for producing cellulosic fibers, because it is closer to green chemistry and biorefinery principles. Organic solvents such as ethanol, with the addition of an acid catalyst to fractionate the lignocellulose into its main components, are used. Generally, organosolv processing results in the extraction of lignin (organosolv lignin) and some solubilization of hemicellulose, thus leaving a solid cellulosic fraction. 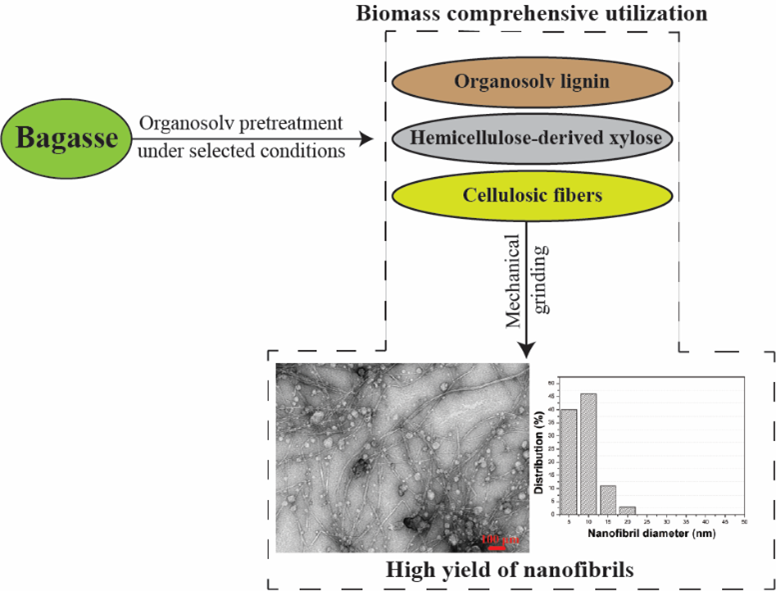 In the organosoluble fraction, monomeric sugars derived from hemicellulose and the recovery of organosolv lignin can improve the economic feasibility of the process through their applications in the fields of cellulosic bioethanol and macromolecular materials (Pan et al. 2005). Therefore, an advantage of organosolv treatment compared with the other extraction techniques is that lignin can be extracted as a separate product. Another advantage of the organosolv process is the ease of the recovery by employing high volatility alcohol through a simple distillation, thus requiring a low energy consumption. Furthermore, the presence of an organic solvent benefits to improve the swelling capacity and reduce the crystallinity of cellulose (Zhao et al. 2009). Therefore, the organosolv pretreated fibers may require low energy for deconstruction in their further application due to the easier breaking of a loosened internal fiber wall (Iakovlev et al. 2010). Recently, the production of NFC batches through organosolv pretreatment of lignocellulosic fibers followed by chemical and mechanical defibrillation has been investigated in several studies (Nascimento et al. 2014; Li et al. 2016; Sánchez et al. 2016; Santucci et al. 2016; Barbash et al. 2017). However, these studies rarely involved the optimization of the pretreated fibers for NFC preparation, which resulted in a limited efficiency of the whole process. The yield, morphologies, and surface chemistry of the resulting NFC was highly dependent on the precursor fibers prepared and employed. The chemical components remarkably affect the fibrillation process and the properties of the resultant NFC (Iwamoto et al. 2008; Spence et al. 2011; Ferrer et al. 2012b; Solala et al. 2012;Chaker et al. 2013; Nair and Yan 2015; Rojo et al. 2015; Delgado-Aguilar et al. 2016; Tarres et al. 2017). In this study, the pretreated bagasse fibers with full control of the chemical components were produced through a novel process involving organosolv pretreatment with trifluoroacetic acid (TFA) as the catalyst (OPT) to provide the optimal precursor fibers for NFC production. Previously TFA, a strong monocarboxylic acid, was found to have good selectivity for hydrolyzing hemicellulose. It resulted in the highest amount of soluble monosaccharides, as well as the least degradation products of monosaccharide among many tested acids including TFA, HCl, H2SO4, HNO3, and H3PO4 (Marzialetti et al. 2008). Moreover, TFA as a biomimetic acid could easily break down lignin and lignin-carbohydrate complexes and release lignin-derived compounds (Guo et al. 2012). Another attractive feature of TFA is that it can be recycled at low operating temperatures because of its low boiling point of 72.4 °C. Therefore, TFA is a promising catalyst to improve the efficiency of the organosolv process for the recovery of cellulose and hydrolyzing hemicellulose and lignin. More importantly, an efficient approach of obtaining cellulosic fibers containing controlled chemical components could be realized through OPT conducted under varying conditions. The mass balance of the pretreated bagasse through OPT (OPTB) was determined by chemical component and total organic carbon (TOC) analysis. The OPTB containing different noncellulosic contents (approximately 20% to 50%) was used to produce NFC through microgrinding. The resultant NFC yield measured through centrifuge processing and NFC morphologies observed via SEM, FE-SEM, and TEM were comparatively investigated to select the most desirable precursor fibers for NFC preparation. The mass balance of hemicellulose-derived and lignin-derived products, which generated in the production of the desirable OPTB, was also presented to provide the preliminary data for the utilization of valuable bioproducts. Additionally, the recyclability of OPT was determined to demonstrate the renewability. Thus, this study optimized the production of NFC and biobased products (mainly xylose and lignin) from bagasse through an efficient, environment-friendly, and recoverable approach of combining OPT with microgrinding. Bagasse used in this study was obtained from a local sugar refinery in Guangxi, China. The raw materials were ground and sieved through a 10-mesh screen. The ground samples were air-dried and stored at 4 °C. The moisture content was approximately 5%. The employed bleached bagasse pulp (BBP) through the kraft pulping process was supplied by a pulp mill in Guangxi, China. where t is the reaction time (min), TH is the hydrolysis temperature (°C), and TR is a reference temperature (most often 100 °C). Log R0 was presented for convenience in this paper. The pretreated materials were divided into the solid fraction (solid residues) and liquid fraction via vacuum filtration using a fritted glass filtering crucible (2G2, Iwaki, Tokyo, Japan). The solid fraction was washed with 500 mL distilled water and then 50 mL ethanol, and the solvent washes were added back into the liquid fraction. The liquid fraction was further divided into precipitates and organosoluble substances by centrifugation (4500 rpm and 20 min). The precipitate mass was measured after drying for 48 h at 70 °C. The volatile solvents, mainly ethanol and TFA, were recovered by a rotary evaporator (Rikakikai co. LTD, Tokyo, Japan) and mixed with water to 250 mL. The 250 mL solution was used to pretreat the bagasse again according to the procedure stated above. This process was repeated five times to determine the recyclability. Precursor fibers with 2% (w/v) solid consistency were immersed in deionized water for 24 h. Then, the resultant suspensions were mechanically fibrillated using a MKZA 10-15J SuperMassColloider (Masuko Sangyo Co., Ltd., Saitama, Japan) at 1500 rpm. The gap between the grinding stones was adjusted to 100 μm from motion zero position with the addition of fiber suspension. The total volume of the feeding suspensions was 10 L. All types of precursor fibers were mechanically defibrillated with 20 passes through the grinder and sampled for further analysis. Energy consumption for the mechanical defibrillation can be evaluated based on our previous studies, in which one pass through the grinder consumed the energy of approximately 2.2 kWh/kg (Jiang et al. 2018; Liu et al. 2018). The contents of Klason lignin, acid-soluble lignin, and carbohydrates in solid residues or precursor fibers were analyzed to calculate the mass balance throughout the pretreatment process, according to National Renewable Energy Laboratory (NREL) chemical analysis and testing standards (NREL 2005). Total organic carbon (TOC) analysis of both solid and liquid products was carried out with the multi N/C 3100 analyzer (Analytik Jena, Jena, Germany). The morphological characterizations of the precursor fibers, their corresponding fibrillated fibers, and resultant NFCs were observed via scanning electron microscopy (SEM), field emission scanning electron microscopy (FE-SEM), and transmission electron microscopy (TEM), respectively. The SEM images of precursor fibers were obtained by a Hitachi S-3400N spectrometer (Tokyo, Japan). Gold (Leica, Wetzlar, Germany) was sputtered on the fiber samples (one cycle of 120 s) in advance, and the samples were examined in secondary electron mode at a beam current of 100 mA and an accelerating voltage of 10 kV (Song et al. 2016). The suspensions of fibrillated fibrils were diluted to a solid consistency of approximately 0.1%, and then stirred for 2 h to ensure a well-dispersed solution for FE-SEM imaging. Several droplets from the diluted suspensions were deposited on a silicon wafer and freeze-dried using a Labconco freeze-drying system (Kansas City, MO, USA). To improve conductivity, the samples were sputtered with thin gold layer before imaging (Leica, Wetzlar, Germany). The images were observed and recorded using a Hitachi SU8220 FE-SEM (Tokyo, Japan). Light transmittance spectra at a wavelength range from 400 to 800 nm of the 0.1% dispersions of the fibrillated fibers were recorded using a UV spectrometer (U-4100, Hitachi High-Tech. Corp., Tokyo, Japan). The transmittances of all the tested samples were reported as the average transmittance at the wavelength of 600 nm (the middle value between 400 and 800 nm). The TEM images of the NFCs were obtained with a Hitachi HT-7700 (Tokyo, Japan) with an acceleration voltage of 100 kV. 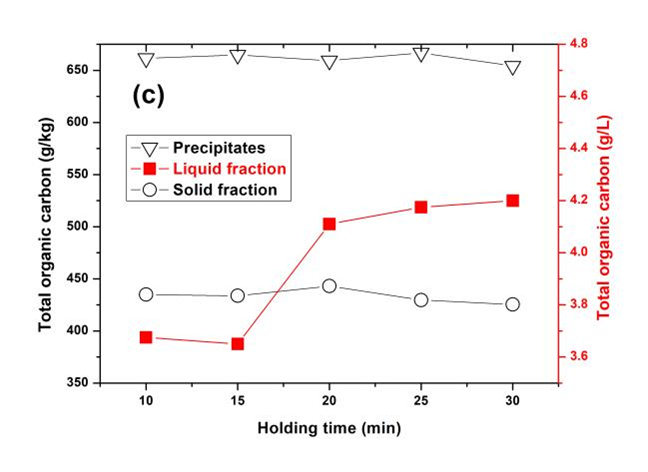 A drop of diluted supernatant (0.005% to 0.01 wt%) fractionated by centrifuge was deposited on a carbon-coated grid (400-mesh) and then dried at room temperature for 12 h. Subsequently, they were negatively stained with 2% uranyl acetate for 20 min in a dark place and were used for imaging. The diameters of NFCs were determined and calculated on the basis of TEM images using an image analyzer program software, Nano measurer (Fudan University, version 1.2, Xiamen, China). A minimum of 60 measurements were performed for evaluating the fibril diameter. Analysis of the hemicellulose degradation products from organosolv pretreatment was performed by determining the xylose monomer and oligomers, furfural, and acetic acid, with high performance liquid chromatography (HPLC; Agilent, Santa Clara, CA, USA). The remaining oligosaccharides in the liquid fraction were hydrolyzed to monosaccharides by 4% w/w sulfuric acid at 121 °C for 60 min. The contents of xylose monosaccharide, acetic acid, and furfural were determined using a Waters device equipped with a refraction index detector and a BioRad (Hercules, CA) Aminex HPX-87H column (300 mm × 7.8 mm, 5 μm). The correspondent guard column was employed simultaneously. A total of 5 mM sulfuric acid was used as an eluting solvent at a flow rate of 0.5 mL/min. Total phenolic compounds in the liquid fraction were determined colorimetrically by the Folin-Ciocalteu method via a standard curve relating to 760 nm absorbance (Sidiras and Koukios 1989). Before the determination, liquid samples were diluted 80 times with distilled water to obtain a final absorbance in the range 0.1 to 0.7. To evaluate the efficiency of organosolv pretreatment with TFA (OPT) as a catalyst on producing cellulosic fibers and the generated by-products, the mass balances of the pretreated bagasse through OPT (OPTB) under various pretreated conditions were analyzed and summarized in Table 1. For comparison, the mass balance of the pretreated bagasse through organosolv pretreatment with sulfuric acid as catalyst (OPSB) under the pretreated conditions of 180 °C, 60 min, and catalyst dosage of 1% (v/v) was also analyzed. This is because H2SO4 has been a commonly used acid catalyst in the organosolv pretreatment of lignocellulosic materials (Pan et al. 2006; Zhao et al. 2009; Mesa et al. 2010a; Mesa et al. 2010b). The data in Table 1 are reported as the average value calculated on the basis of the results of three replicate experiments. 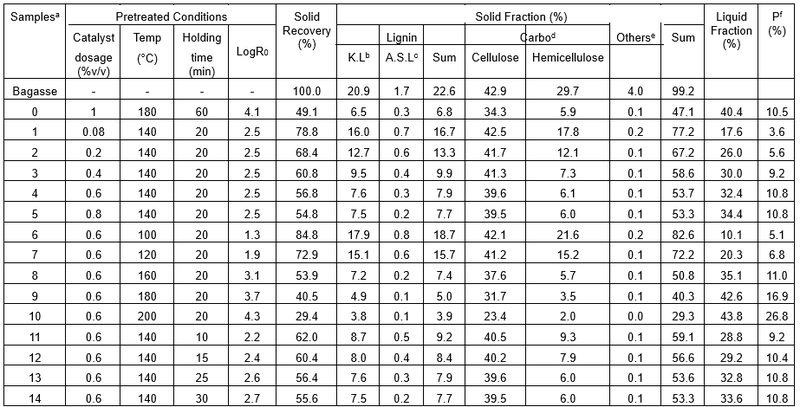 As shown in Sample 0 of Table 1, the OPSB contained approximately 70% w/w cellulose, approximately 14% w/w lignin, approximately12% w/w hemicellulose, compared to approximately 43% w/w cellulose, approximately 23% w/w lignin, and approximately 30% w/w hemicellulose in the untreated bagasse. For Sample 4 of Table 1, the OPTB contained approximately 70% w/w cellulose, approximately 14% w/w lignin, and approximately 11% w/w hemicellulose, and when obtained under the pretreated conditions of 140 °C, 20 min, and catalyst dosage of 0.6% (v/v) showed nearly the same chemical components as the OPSB. This indicated that OPT was a more effective approach of producing cellulosic fibers than OPS, in consideration of its more moderate pretreated conditions of lower pretreatment temperature and shorter pretreated time. a Bagasse is the untreated feedstock. Sample 0 is the pretreated bagasse through organosolv pretreatment with H2SO4 as catalyst (OPSB), and Samples 1 through 14 are the pretreated bagasse through organosolv pretreatment with TFA as catalyst (OPTB). The contents of all the products are relative to the mass of starting material; b Klason lignin; c Acid soluble lignin; d Carbohydrates; e Other extractives and ash; f Precipitates. Additionally, the solid recovery of Sample 4 (56.8%) was higher than that of OPSB (49.1%), suggesting that OPT could produce a higher yield of cellulosic fibers through an energy-saving way. The findings that TFA as the catalyst of organosolv pretreatment was not only beneficial to the removal of noncellulosic components, but also favorable for the recovery of cellulose could be due to the following factors: 1) TFA is a strong biomimetic acid that could easily break down lignin and lignin-carbohydrate complexes and release lignin-derived compounds (Guo et al. 2012). The TFA is also favorable for hemicellulose degradation (Marzialetti et al. 2008). Thus, the removal of lignin and hemicellulose could be promoted by the presence of TFA. 2) The TFA at an elevated temperature could hinder the hydrolysis of crystalline cellulose (Zhao et al. 2007). Moreover, the volatility of TFA might also contribute to creating a mild buffering condition that restrains the hydrolysis of cellulose by partitioning more of the acid into the vapor phase. Therefore, TFA helped to improve the recovery of cellulose. The recovered organosolv lignin through organosolv pretreatment can improve the economic feasibility through its use as macromolecular materials (Benar et al. 1999). As shown in Samples 0 and 4, the precipitated organosolv lignin accounted for approximately 50% of the Klason lignin in the untreated bagasse. Additionally, Klason lignin accounted for approximately 95% of the precipitates in both Samples 0 and 4 (data not published here). However, the pretreated conditions of Sample 4 were more moderate than those of Sample 0. Therefore, the OPT was a more efficient approach for the recovery of organosolv lignin compared to OPS. When the pretreated temperature reached to 200 °C (Sample 10 of Table 1), the mass of precipitates even exceeded that of the total lignin in the untreated bagasse, indicating that other components, such as carbohydrates, were present in the precipitates in this case. In Samples 0 and 4, approximately 80% of the total hemicellulose in untreated bagasse were hydrolyzed after pretreatment and recovered in the liquid fraction. Previously, TFA was found to be a better catalyst for the hydrolysis of polysaccharides compared to H2SO4. 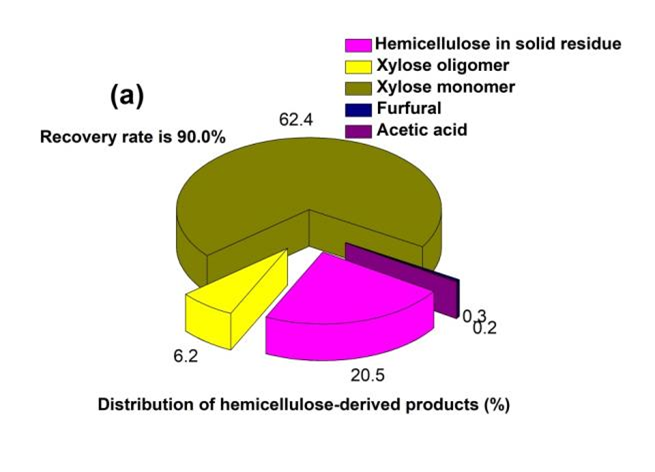 Because TFA was helpful for the selectivity of hemicellulose degradation, it caused less degradation of the resulting monosaccharides (Marzialetti et al. 2008). It can be hypothesized that monosaccharides could be produced from hemicellulose as valuable bioproducts through OPT. The TOC analysis was tested to further seek the mass balance closure of the OPTB obtained under various pretreated conditions. The TOC distributions of the OPTB are described in Fig. 1. The calculation of mass balance achieved close agreement in all studied cases (approximately 100%) within the expected bounds of accumulated analytical errors. The TOC of each resultant fraction after pretreatment mostly depended on the pretreated conditions. Moreover, the TOC distribution of the OPTB was in accordance with the mass distribution measured by the chemical composition analysis in Table 1. Thus, cellulosic fibers with full control of the chemical components could be produced through OPT to provide precursor fibers for NFC production. 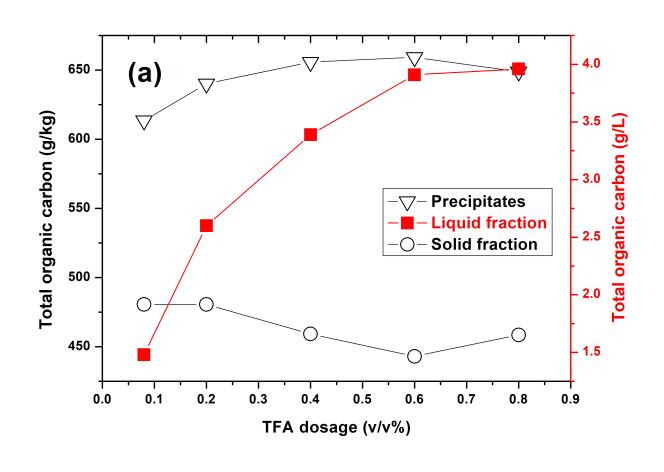 Effects of the TFA dosage, pretreated temperature, and holding time on the TOC concentration of each resultant fraction through OPT are shown in Fig. 2. The TOC concentration of solid residue slowly decreased and then increased with increased TFA dosage and pretreatment temperature. Generally, the TOC concentration of lignin was higher than that of the carbohydrates. Thus, the TOC concentration of solid residue decreased due to the removal of lignin from when the pretreated conditions became more severe. However, the TOC concentration of solid residue slightly increased beyond TFA dosage of 0.6% (v/v) and pretreatment temperature of 180 °C. 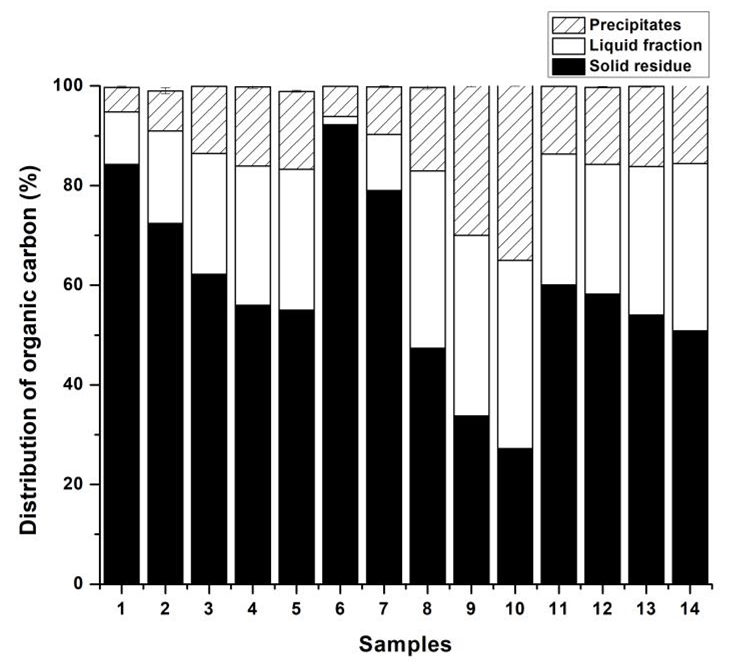 This was likely due to the condensation and redeposition of the lignin on the solid residues occurring in the environment of low pH and high temperature (Park et al. 2010). The TOC concentration of precipitates had an inverse tendency with that of the solid residues, mainly due to the transition of lignin and carbohydrates between them. When the pretreated temperature reached to 200 °C, the TOC concentration of precipitates slightly decreased, due to more carbohydrates existing within the precipitate. However, the TOC concentration of precipitates, which mainly consisted of lignin-derived products, was always higher than that of the solid residue. 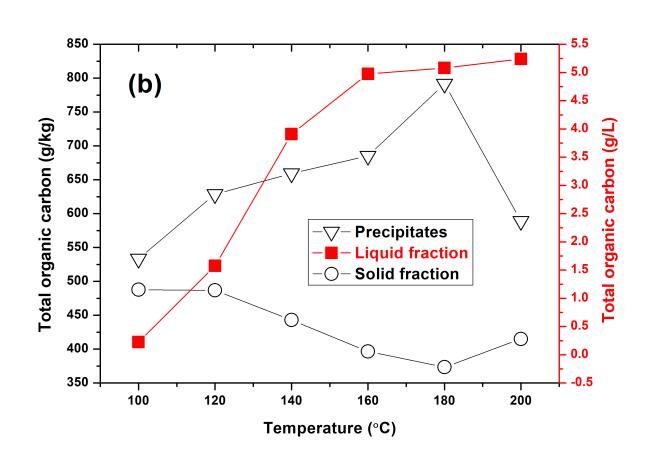 As expected, the TOC concentration of liquid fraction increased when the pretreating conditions became more severe. When optimizing the OPTB for the production of NFC, the OPTB fibers containing different chemical compositions (Samples 1 to 14) were mechanically defibrillated through microgrinding. Bagasse, OPSB, and bleached bagasse kraft pulp (BBP) (with approximately 81% w/w cellulose, 0.3% w/w lignin, and 18.5% w/w hemicellulose) were also mechanically ground for the references. Precursor fibers employed in this study were from the same fiber source, but they underwent different treatment processes. The distinct difference between the OPTB fibers could be regarded as the noncellulosic content. Moreover, due to the remarkable effects of noncellulosic content in precursor fibers on the NFC preparation process (Spence et al. 2011; Santucci et al. 2016; Park et al. 2017; Tarres et al. 2017), it was necessary to control it through adjusting the pretreating process for the high efficiency of nanofibrillation process. The NFC yield was defined as the percentage of cellulose particles with at least one dimension in nanoscale (1 to 100 nm). The NFC yield directly related to the applied performances of the corresponding fibrillated fibers, so it was a key index to be analyzed. The relationship between NFC yield and noncellulosic contents of precursor fibers is presented in Fig. 3. Figure 3(a) shows the relationship between the noncellulosic content of precursor fibers and the resultant NFC yield based on the mass of precursor fibers. The results indicated that noncellulosic components influenced the NFC yield. The OPTB fibers containing noncellulosic components of approximately 28 to 30% showed the highest NFC yield of approximately 71% among all of the tested samples. Moreover, the noncellulosic content of < 27% led to the decrease of the resulting NFC yield from the OPTB fibers. The findings suggested that the presence of noncellulosic components in the precursor fibers could facilitate the mechanical dismantling of the cellulose fiber structures and improve the resultant NFC yield. As a reference, BBP fibers containing 19% noncellulosic components showed a NFC yield of 59.4% based on the mass of the precursor fibers. In comparison, the NFC yields of OPTB fibers with higher noncellulosic content ranging from approximately 20 to 35% reached approximately 61 to 72%, which were higher values than that of BBP. A high NFC yield of 71% was also obtained when using OPSB as precursor fibers for mechanical grinding. These results again demonstrated the effects of noncellulosic components in promoting the nanofibrillation. However, the resultant NFC yields of OPTB fibers with noncellulosic content of > 31% showed a decreasing trend with the increase of the noncellulosic content. Additionally, the NFC yield was as low as 19% when using bagasse fibers for direct mechanical grinding. These results suggested that high amounts of noncellulosic components in precursor fibers reduced the efficiency of fibrillation and made the nanofibrillation more difficult. Thus, a moderate amount of noncellulosic components in precursor fibers are recommended to achieve a high fibrillation efficiency and improve the resultant NFC yield. The positive roles that noncellulosic components played on facilitating the fibrillation were ascribed to several factors. 1) The formation of mechanoradicals derived from lignin in mechanical grinding systems could potentially counteract recombination reactions between highly reactive cellulose radicals due to their strong radical scavenging ability (Solala et al. 2012). Thus, very stable phenoxy radicals could be generated and the fibrillation was facilitated. 2) Hemicelluloses could also act as inhibitors of the coalescence of microfibrils (Iwamoto et al. 2008), ascribed to a higher total charge density in heteropolysaccharide-containing fibers. Moreover, the hemicellulose was related to fiber flexibility and swelling, which impacted the fibrillation process (Chaker et al. 2013). Higher hemicellulose content in precursor fibers was possibly in favor of an easier fibrillation process. Additionally, some previous studies also stated that moderate percentages of amorphous constituents in cellulosic fibers promoted the mechanical fibrillation (Ferrer et al. 2012a; Boufi and Gandini 2015; Nair and Yan 2015). However, the effect of noncellulosic components on reducing the defibrillation efficiency must be noted. This was mainly because more forces and energy were required during the mechanical fibrillation process to break the strong covalent linkages between cellulosic and noncellulosic components, as well as the structural heterogeneity and complexity of the cell wall constituents (Delgado-Aguilar et al. 2016). Additionally, reduced porosity or nanospace between cellulose microfibrils, due to the existence of noncellulosic components, might have also contributed to the difficult fibrillation. The presence of noncellulosic components causing the reduction of defibrillation efficiency was also reported in previous studies (Lee et al. 2010; Okahisa et al. 2011; Delgado-Aguilar et al. 2016). With the purpose of obtaining a high NFC yield from bagasse via an efficient way, the NFC yield based on the mass of raw materials must be taken into account. As shown in Fig. 3(b), among all the tested samples, the OPTB fibers with noncellulosic content of approximately 28 to 35% showed the highest NFC yields of approximately 40% (based on the mass of raw materials). In comparison, the NFC yields of OPTB fibers with noncellulosic content of < 28% or > 35% were far lower. These results indicated that bagasse fibers should be pretreated under selected conditions to produce precursor fibers containing proper noncellulosic components, with the purpose of obtaining a high resultant NFC yield. In this study, the optimum conditions of producing OPTB for NFC preparation were found at 140 °C for 20 min with a TFA dosage of 0.6% (v/v). In this case, a NFC yield (based on the mass of precursor fibers) of 72% was obtained through microgrinding of the desirable OPTB containing approximately 29% noncellulosic components, and the resultant NFC yield based on the mass of raw materials was 40.4%. Not only a high resultant NFC yield could be achieved through producing the OPTB under the optimum conditions, but also amounts of valuable bioproducts could be obtained in an efficient and energy-saving way. Therefore, using OPT to produce precursor fibers for NFC preparation was similar to green chemistry and biorefinery principles. As shown in Fig. 3(b), the NFC yield of BBP was only 27% (based on the mass of raw materials). Considering the high energy and chemical consumption of traditional kraft pulping and the elemental chlorine free (ECF) bleaching processes, it was not a cost-effective strategy for using BBP as precursor fibers to produce high yield of NFCs. The NFC yield of 34.9% (based on the mass of raw materials) obtained through combining OPS with microgrinding of bagasse was lower than that of 40.4% through combining OPT (conducted under the optimum conditions) with microgrinding. Regarding to nearly the same NFC yield (based on the mass of precursor fibers) obtained by the two approaches (as shown in Fig. 3a), the lower NFC yield (based on the mass of raw materials) obtained through combining OPS with microgrinding of bagasse was mainly due to the lower recovery of cellulosic fibers through OPS than that through OPT. The SEM images of BBP and OPTB fibers containing high, medium, and low noncellulosic contents of 50%, 29%, and 20% (namely OPTB-H, OPTB-M, and OPTB-L), respectively, are shown in Fig. 4(a). The OPTB-H had a glossy and rigid surface. In comparison, the surface was broken and became etched, collapsed, and uneven, as shown in the samples of OPTB-M and OPTB-L. The BBP fibers showed the most accessible surface among the four tested fibers samples. The four samples of fibrillated fibers from the mechanical grinding of BBP, OPTB-L, OPTB-M, and OPTB-H fibers, under the same grinding conditions, were characterized by FE-SEM, and the corresponding images are shown in Fig. 4(b). The results indicated that the fibrillation extent of the four fibrillated fibers samples increased in the order of OPTB-H, BBP, OPTB-L, and OPTB-M, which is consistent with the corresponding results of the NFC yields in Fig. 3(a). The higher fibrillation extent of OPTB-M than that of OPTB-L was mainly ascribed to the effect of noncellulosic components on promoting the defibrillation. However, excess noncellulosic components in precursor fibers reduced the fibrillation efficiency, and the fibrillated fibers from OPTB-H showed the lowest extent of fibrillation among the four types of fibrillated fibers. Lignin particles adhering to the fibers were clearly visible in the FE-SEM images of the fibrillated fibers from OPTB fibers. They were produced through mechanical grinding of lignin-containing fibers. The darkness of the color of the fibrillated fibers suspension was in proportion to the residual lignin content in the fibers, as shown in Fig. 4(b). Additionally, the fibrillated fibers suspension of OPTB-M was more visually transparent (with light transmittance of 50% at the wavelength of 600 nm) than those of the other fibers. The highly fibrillated fibers from OPTB-M had smaller diameters and more uniform diameter distributions, which led to less light-scattering phenomenon and a higher transparency of the corresponding suspension (Liu et al. 2010). The FE-SEM analysis focused on examining the large structures of fibrillated fibers. However, nanoscale cellulose structures existing in unfractionated samples were sometimes undetectable by FE-SEM due to the limited resolution. Herein, TEM was employed to analyze the nanofibril network and provide clear visualization of the ultra-fine morphologies of fibrillated fibers. In this study, the TEM observations were performed on the supernatant fraction of the fibrils suspension subjected to centrifugation, without concerning the large structure of fibrillated fibers. The observation results are shown in Fig. 4(c). The measured diameter distribution based on the TEM images of NFCs indicated that the number-average diameters were 23.2, 20.2, 9.4, and 8.9 nm for the NFCs from BBP, OPTB-L, OPTB-H, and OPTB-M, respectively. Furthermore, the NFCs from OPTB-M and OPTB-H showed similar diameter distributions, and they had narrower diameter distributions than those from BBP and OPTB-L. 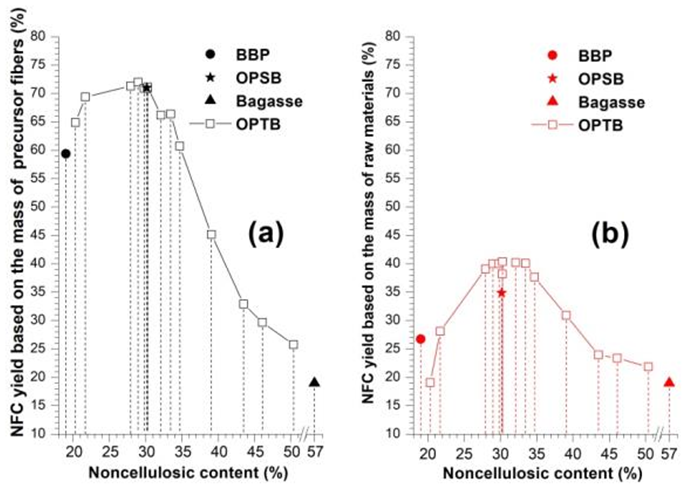 In consideration of the high noncellulosic contents in the OPTB-M and OPTB-H (29% and 50%, respectively) and the low noncellulosic contents in the BBP and OPTB-L (19% and 20%, respectively), it was concluded that noncellulosic components in the fibrils played important roles on reducing the mean diameters of the resultant nanofibrils. In particular, although the fibrillated fibers from BBP were more extensively delaminated and showed a higher NFC yield than those from OPTB-H, the diameters of NFCs from OPTB-H were smaller. This suggested that the diameters of the resultant nanofibrils were more dependent on the chemical components of fibers than the fibrillation extent of fibers. Based on the FE-SEM and TEM images in Fig. 4, it was concluded that the presence of noncellulosic components, mainly lignin and hemicellulose, can reduce the fibrillation efficiency of micron fibers (as proved by the fibrillation extent of OPTB-M > OPTB-H in Fig. 4(b)), due to their covalent linkages with cellulose. However, when mechanical grinding partly deconstructed these linkages and most of the micron fibers were defibrillated, lignin and hemicellulose facilitated the defibrillation (as evidenced by the fibrillation extent of OPTB-M > OPTB-L in Fig. 4(b)). This led to more individualized nanofibrils with smaller diameters (as proved by the nanofibrils’ diameters of OPTB-H and OPTB-M > OPTB-L in Fig. 4(c)), due to their effects on counteracting the recombination and inhibiting the coalescence of nanofibrils. Therefore, the selected pretreatment for precursor fibers was necessary to remove a proper amount of noncellulosic components to improve the fibrillation efficiency and NFC yield. 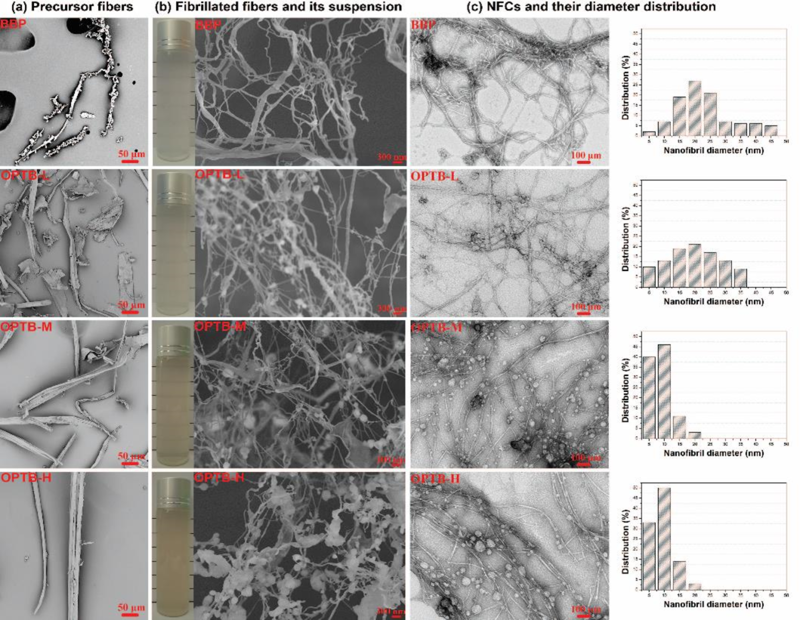 Micro- and nano-lignin particles were widely distributed on lignin-containing fibrillated fibers and they were likely to be related to some improved properties of lignin-containing NFC-based materials (Nair and Yan 2015; Rojo et al. 2015). Based on Nair and Yan’s study (2015), OPT conducted under selected conditions proved to be an efficient method of preparing precursor fibers for producing high yields of NFCs. With the exception of OPTB, the valuable bioproducts produced through OPT of bagasse should also be utilized. For this purpose, both hemicellulose-derived and lignin-derived products from OPT of bagasse under the selected conditions of 140 °C, 20 min, TFA dosage of 0.6% (v/v), were quantitatively identified. Figure 5 shows the quantitative distribution of the bioproducts. Due to the hemicellulose of bagasse being mostly composed of xylose units, the hemicellulose-derived products are mainly xylose oligomers and monomers, and xylose degradation products. As shown in Fig. 5(a), 62.4% of the hemicellulose in the bagasse can be converted to xylose monomers through OPT. The hemicellulose-derived xylose accounted for 19% w/w of the raw materials. The generated monomeric sugars are valuable because they can be utilized for the production of bioethanol through a fermentation process. The results indicated that a low amount of xylose oligomers were produced through OPT. Therefore, OPT can be regarded as an effective method for the recovery of hemicellulose-derived monosaccharides. Accordingly, furfural and acetic acid were the key degradation products of pentoses under the acid conditions, and they could work as inhibitory compounds to the microorganisms in the biological fermentation process when their amounts were more than 2% of concentration and 6 g/L, respectively (Laluce et al. 2012). Through OPT of bagasse, the concentrations of the generated furfural and acetic acid were 0.3% (21.1 mg/L) and 0.2% (19.6 mg/L) of the total hemicellulose mass, respectively. The concentrations of the inhibitory compounds were far less than those for taking inhibiting effects. Some were possibly responsible for the effect of OPT on preventing xylose degradation. Generally, the protonation of 2-OH on the sugar ring to form 2,5-anhydride intermediate (furfural precursor) was the rate-limiting step for xylose degradation. Ethanol could shield xylose from protonation by forming a strong interaction with xylose and effectively increase the monosaccharide yield in the acid condition (Qian et al. 2005b). The TFA anion could also prevent xylose degradation by disturbing the protonation step. The TFA was in favor of the formation of the hydrogen bonds between water molecules and hydroxyl groups on the sugar rings (Qian et al. 2005a). Consequently, it prohibited the reaction to furfural by extracting/donating a proton from/to the intermediate. Therefore, OPT of bagasse proved to be a potential approach of recovering xylose monomers for bioethanol production. Figure 5(b) shows the distribution of lignin-derived products from OPT of bagasse. The organosolv lignins accounted for nearly 80% of the lignin-derived products. Moreover, it meant that 11% of the bagasse could be converted to organosolv lignins through OPT. 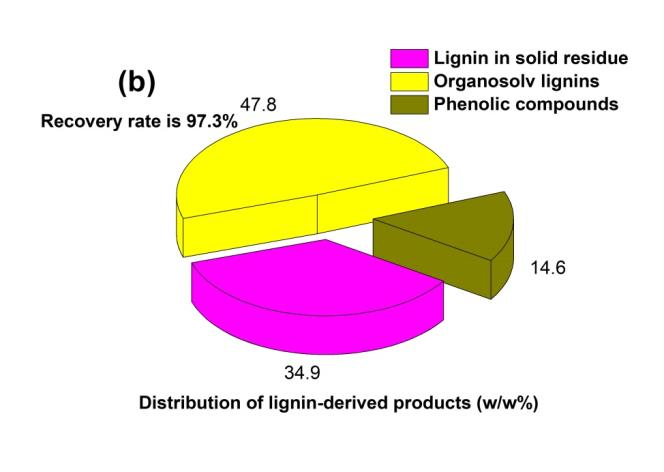 The appreciable amounts of organosolv lignins can contribute to the comprehensive utilization of biomass as the high-quality technical lignin (Stephen et al. 2012). The results indicated that 14.6% of the lignins were degraded into phenolic compounds, and the phenolic compounds might be suitable materials for hydrogen generation via aqueous phase reforming (Valenzuela et al. 2006). The chemicals used in the OPT, mainly ethanol and TFA, had high recyclability, due to their low boiling points of 78 °C and 72.4 °C, respectively. An experiment was conducted for testing the recyclability of OPT performed under the selected conditions of 140 °C, 20 min, and TFA dosage of 0.6% (v/v). As shown in Fig. 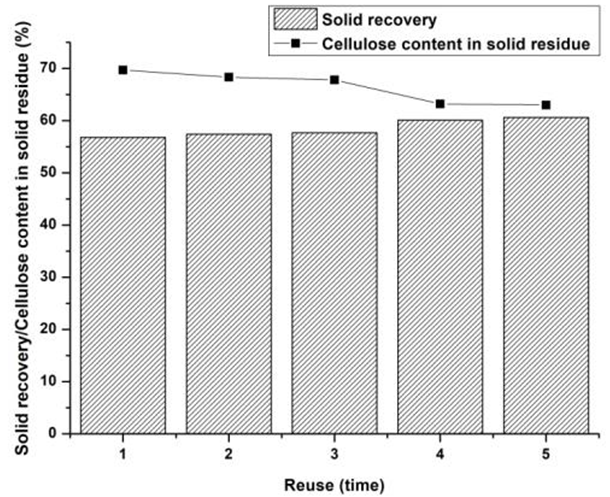 6, the solid recovery and cellulose content of solid residue were almost constant after three runs of OPT, which indicated that no obvious loss of the treating efficiency occurred. When the chemicals were reused four times, the treating efficiency of OPT showed a slight decrease. Therefore, OPT proved to be a highly recoverable approach. The combination of organosolv pretreatment with trifluoroacetic acid (OPT) with microgrinding was applied to produce NFC from bagasse in a novel green approach. The OPT proved to be an energy-saving, efficient, and recyclable way to provide cellulosic fibers and extract bioproducts from hemicellulose and lignin. Noncellulosic contents of precursor fibers played important roles in the mechanical defibrillation process. Specifically, the presence of noncellulosic components was advantageous to improving the resultant nanofibrillated cellulose (NFC) yield and produce individualized nanofibrils with small and uniform diameters. However, an excessive amount of noncellulosic components reduced the fibrillation efficiency. Optimization of the noncellulosic content in the precursor fibers was necessary for NFC production. As evidence, the bagasse pretreated by the OPT process (OPTB) containing moderate noncellulosic content of 29% was the most desirable precursor fiber for producing NFC, which resulted in a high NFC yield of 72% through microgrinding and the generated nanofibrils with an average diameter of 9 nm. Moreover, nearly 90% of the bagasse was effectively utilized through the production of the desirable OPTB fibers, in which 57% was converted to cellulosic fibers for NFC preparation and 30% was recovered as valuable bioproducts including the hemicellulose-derived xylose (19%) and lignin-derived organosolv lignin (11%). This study offered a promising approach for the commercially high-value-added utility of bagasse, which can produce high yield of NFCs and considerable quantities of valuable biomass based by-products. The authors thank the supports from the China Scholarship Council under Grant No. 201706660011 and the Project for Graduate Study Overseas of Guangxi University. The research is sponsored by the Innovation Project of Guangxi Graduate Education (YCBZ2018016), the National Natural Science Foundation of China (21766002), the Scientific Research Foundation of Guangxi University (XTZ140551), and the Foundation of Guangxi Key Laboratory of Clean Pulp ＆Papermaking and Pollution Control (KF201606 and ZR201603). National Renewable Energy Laboratory (NREL) (2005). Determination of Structural Carbohydrates and Lignin in Biomass (NREL/TP-510-42618), U.S. Department of Energy National Renewable Energy Laboratory, Golden, CO.
Park, N., Kim, H. Y., Koo, B. W., Yeo, H., and Choi, I. G. (2010). “Organosolv pretreatment with various catalysts for enhancing enzymatic hydrolysis of pitch pine (Pinus rigida),” Bioresource Technology 101(18), 7057-7064. DOI: 10.1016/j.biortech.2010.04.020. Article submitted: July 26, 2018; Peer review completed: October 28, 2018; Revised version received: November 5, 2018; Accepted: November 13, 2018; Published: November 19, 2018. Figure S1. A summary of the optimization of producing nanofibrillated cellulose (NFC) from bagasse via a novel green approach – combining an organosolv pretreatment with microgrinding.